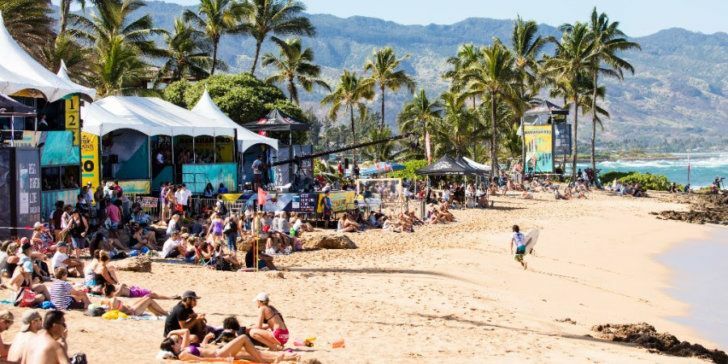 HALEIWA, Oahu/Hawaii – (Saturday, November 11, 2017) — Opening day of the 2017 Vans Triple Crown of Surfing (VTCS) holding period will kick off tomorrow with Event No. 1, the Hawaiian Pro, at Haleiwa Ali’i Beach. This competition is the second to last World Surf League (WSL) Qualifying Series (QS) 10,000 event and holds major qualification implications for athletes looking to join the Championship Tour (CT) and maintain their place among the world’s best. With small surf in the forecast for the Hawaiian Pro, Event No. 1 of the VTCS will be an opportunity for the best in the air game business to shine, including CT competitors Felipe Toledo (BRA) and John John Florence (HAW). Last year, Florence won the Hawaiian Pro with a mash-up of aerial maneuvers and powerful surfing and will look to defend his title to secure an early lead for a fourth VTCS victory. Local wildcard Kalani David (HAW) is also known for his progressive aerial technique and has been sharpening his tools in freesurfs around the North Shore. The waves on offer at Haleiwa will bode well for his style and David looks forward to the opportunity to test his prowess against the stacked field, which includes over 80 percent of the CT’s top 34. Contest organizers will assess conditions each morning, however the forecast is showing strong indication that the surf will pick up early-mid next week. The weather pattern known as La Nina, the periodic cooling of the equatorial eastern and central Pacific Ocean, is expected to bring above average trades and N to NE swell and below average WNW to NW swell to Hawaii this winter season. However, the North Shore experienced a similar La Nina pattern in 2008/09 and saw big wave veteran Greg Long win the Quiksilver in Memory of Eddie Aikau Big Wave Invitational in 2009 in massive surf at Waimea Bay. Fans can expect an exciting showdown from some of Hawaii’s top athletes during Round One of competition, including 2014 Hawaiian Pro victor Dusty Payne and recently crowned WSL Hawaii/Tahiti Nui Junior Champion Barron Mamiya, who will debut his rookie VTCS performance in Heat 5 against Payne, Dion Atkinson (AUS) and Taumata Puhetini (PYF). Another rookie standout will be Maui’s Cody Young, who finished as a Semifinalist in the recent HIC Pro at Sunset Beach, which qualified him for the Hawaiian Pro. Once the event has been called ON, an email alert will be sent via the Media & Communications Manager with updates on timing for the video news reel, official press release and image gallery. If you would like to be part of this notification, please reply to this email or send a message to lrolland@worldsurfleague.com. For more information, please visit www.worldsurfleague.com or download the WSL app to receive updates on your mobile device and watch LIVE action, or tune into Spectrum SURF Channel, which will televise the 2017 Vans Triple Crown events LIVE and in replay on digital channels 250 SD and 1250 HD, across the state of Hawaii.